Travel Diary: Enjoy Para Sailing In Goa This Summer! I know just the perfect stimulating and thrilling high flying adventure activity that your family will love to indulge in this summer: Para sailing in Goa. Goa is the perfect haven for all tourists in summer. There is plenty to do, see and "feel" and chill out too in Goa. The place has plenty of beaches to head to if you need to cool down by taking a dip in the Arabian Sea. The most popular beaches for the tourists in Goa are Calangute, Anjuna beach, Baga beach, Condolim beach, Majorda beach, Dona Paula beach, etc. Enjoy the thrill and excitement of water sports activities at any of the beaches mentioned above. You can indulge in Para sailing, Windsurfing, Dinghy Sailing, Water-Skiing, Body boards, Motor-boats rides, Water-scooter rides, Snorkeling and Jet-ski rides. Not only this you can also indulge in Scuba diving, Canoeing and Fishing. Para sailing is an ideal sport to indulge in while in Goa, specially during the summers. The best time for this activity is between October-May. If you love the idea of flying high like a bird and looking at the world from the top, then this is a thrilling adventure sport for you. Para sailing is one of the best and the favorite amongst all the adventure lovers. Imagine yourself flying high on the Arabian Sea with clear blue skies of the summer, feeling the cool breeze against your face as you take in all the sights, from high up there, of the beach, the surrounding shores and coastline. Hey, don't you feel on top of the world? It's a real once in a lifetime experience. One can also get to spot Dolphins in the Arabian Sea from any of the above mentioned beaches. They usually swim in pairs and can be seen from quite close quarters. They even come quite close to your boat and swim alongside if you don't disturb them too much. There are boats that take you out to the sea for an hour or so for this activity. Kids just love to see Dolphins. Goa is a place that anybody would fall in love with in an instance. The local people (Goans) are very friendly and so very hospitable. The best place to chill out in Goa is at the beach. Of course, you need to be in good company, either with your friends, family or even by yourself. If you are alone, you will never feel lonely at the beach. Just chill out at one of the beach shacks with a cool drink of your choice along with some mouth watering appetizers and enjoy the scenery of the waves crashing on the sands, people enjoying in the water, beautiful women or handsome guys in their swim suits tanning themselves on the beach chairs under the colorful umbrellas. Sit around long enough to watch the sunset and take in the sights and smells of the sea and food. Goan food is excellent to taste and so if you visit Goa then don't forget to indulge yourself in the culinary delights of Goan Cuisine. You get delicious sea food at any of the beach shacks restaurants that are simply delightful. 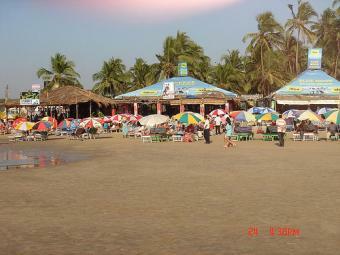 Goa is a beach paradise. The perfect place and an ideal destination to spend your holiday in the summer. It is a perfect place for Swimmers, anglers, sunbathers and water sport enthusiasts, for whom the coastline will seem like heaven. Goa is surrounded with greenery due to its lush forests of coconut trees, mango trees, cashew trees etc, and so it is very refreshing to drive around the countryside in a two wheeler or a four wheeler, if you have driven down, say from Mumbai or a similar place close to Goa. Most tourists (foreign) just hire a two wheeler and drive around to explore all the places in Goa. I personally love to visit Goa whenever I can. I love to sit in one of the beach shacks and watch other people having fun while I indulge myself in some delicious sea food appetizers and a cool drink. The best time to visit Goa is also during Christmas time. That's the time when all the people are in a festive mood and the streets are lit up with lights. It is an exhilarating experience to take a boat cruise down the Mandovi river at this time as the shores are all brightly lit. There are also Casino boats that go out on a cruise on the river while you are busy floundering and gambling away all your money. Come to Goa and experience the warmth and hospitality of the place and the people. You will remember this experience for the rest of your life and will always want to come back for more...!